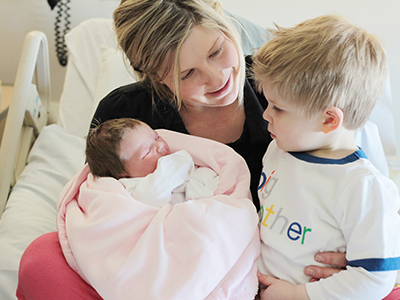 Munson Medical Center’s Family Birth Center houses the 19-bed Maternity Unit, the 22-bed Neonatal Intensive Care Unit (NICU), and the Healthy Futures program. The Family Birth Center features spacious, private birthing rooms where you and your baby will spend your stay in the hospital. Your room is fully equipped with the technical equipment needed to support your birth experience. Each room is large enough to allow your family to spend time with you and your baby and practice new parenting skills with the help of specially trained nurses. To support family learning and bonding, sleeping arrangements in the room can be made for one additional adult. Visiting hours are open, however, visits should be limited to give you time to rest and learn to care for yourself and your baby. Because of the frequency of childhood illnesses, only the baby’s siblings may visit – no other children should visit. All visitors must wash their hands or use hand sanitizer before holding your baby. 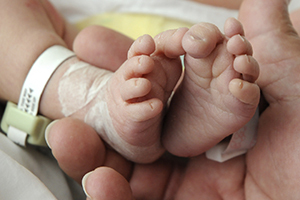 The Family Birth Center provides a highly secure environment for infants. Confidential room assignments, video monitoring of exits, electronic security bands worn by all infants, and locked entrances to the unit all help keep newborns safe. As you prepare for the birth of your baby, it is important to learn what to expect and how to care for your baby and yourself. Our highest priority is ensuring that you have all the information you need to keep both you and your baby safe and healthy. challenges; coping skills; pain medication options; cesarean birth; and postpartum care of mother and baby. A one-day class or 4-week series are available. you greater confidence about going home with your baby. Understanding normal newborn development will allow you to more confidently set the pace with your infant’s immature nervous system. Home and travel safety considerations are also discussed. Certified lactation consultants, along with knowledgeable nursing staff, will help you get off to a good start while in the hospital. Once you go home, you can have your questions answered by a certified lactation consultant by calling our warm line at 231-935-2591. Appointments are also available through the Munson Breastfeeding Clinic when professional assistance is needed. Please call 231-935-2591.
to expect in the hospital; possible early difficulties and returning to work; along with practical tips and community support. Pregnant women and their partners are encouraged to attend this one-night class. Find a class. If you experience breastfeeding issues once you go home that cannot be addressed with a warm line discussion, appointments with a certified lactation consultant are available daily. Lactation consultants have afternoon hours available for individual breastfeeding assistance at the Breastfeeding Clinic, located on the second floor of the hospital (C2). Help is available for feeding issues, pre and post-weight checks, and for questions regarding a successful breastfeeding experience. Call 231-935-2591 for an appointment or questions. For immediate or urgent concerns, please call your health care provider. A lactation consultant or registered nurse, along with other mothers, will provide pregnant and breast-feeding women reassurance and answers. Please come share your experiences in this informal, friendly setting. There is no charge to attend. Class meets from 3 - 4:30 pm on Mondays at Munson Community Health Center. View our schedule. Munson Medical Center’s Immunization Program can help you get the remainder of your baby’s immunizations. This program provides free vaccinations to uninsured or underinsured children (birth to age 18) every Saturday and Sunday from 10 am - 6 pm, and Mondays from 6 - 9 pm. No appointment is required. For more information, call 231-935-6270. You baby’s health care provider and county health departments also offer immunizations by appointment, Vaccinations cannot be given without the child’s immunization record. Please be sure to bring your child’s immunization record with you.